100 baits in 2 hours! Some fun days fishing with Ken & Rhonda, and Robert & Susan. Great inshore action with some big Dogtooth snapper, with one insane morning where we went through 100 baits in 2 hours!! over 30 Roosterfish, 20 snapper, and a few others in the mix. Finally a boat in the water! Here is our new 21′ Bay Boat “REEL HARD”, floating and ready for the season. 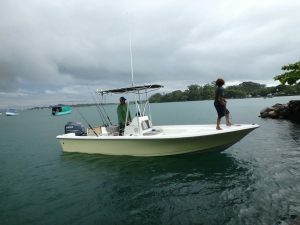 We will run this as an inshore boat with 2 angler and Capt. only. With over an 8′ beam, this boat handles great in the chop and pleanty of room. 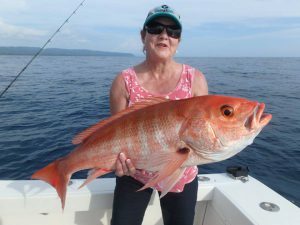 At Tropic Fins Adventures we enjoy all aspects of fishing. 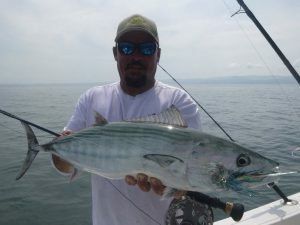 For those of you who want to hook up on the fly, we have the equipment and techniques to get you hooked up inshore and offshore.